‘I was lucky to be attacked by a great white,” says Glenn Orgias, who last February was dragged beneath the Bondi rollers by a 2½-metre white pointer. At 7.30 on an overcast evening, Orgias was paddling for a wave in the centre of Australia’s most famous beach when he felt a tugging on his left arm. He thought it was a surfer jostling for position. ”I thought another surfer had grabbed me and was trying to stop me getting the wave,” the 34-year-old says. ”Then in a split second it all changed and something really powerful and massive dragged me straight under and started shaking me around. After an estimated seven or eight seconds underwater, Orgias was released and popped to the surface. Scrambling on to his board, he saw the sea turning red. His left hand was dangling by a piece of skin. As he paddled frantically back to shore, he kept thinking about his pregnant wife. When he finally reached the sand, two surfers applied a makeshift tourniquet. 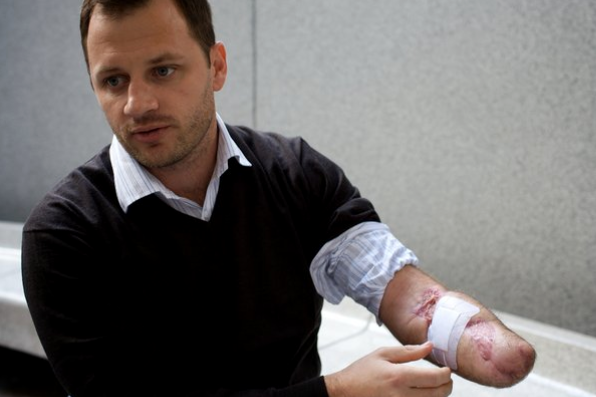 Glenn Orgias lost a hand after he was bitten by a great white shark while surfing at Bondi Beach. Later, as his condition stabilised in hospital, Orgias befriended a navy diver who had been attacked by a bull shark in Sydney Harbour a day earlier. Ultimately, Orgias lost his hand, whereas Paul de Gelder lost his arm and a leg. In coast-loving Australia, the shark occupies a special place in the collective psyche. A scary monster for adults, it’s a creature from the depths of prehistory and our own unconscious, a dark shadow with dead eyes and razor teeth. The surprise is how rarely sharks attack. According to the Australian Shark Attack File compiled at Taronga Zoo, there have been 24 recorded Australian fatalities due to shark attacks in the past 20 years. There has been, on average, one fatal attack a year since 1791. Not that the figures have been stable. In the 1930s, with Aussies starting to embrace beach culture, 38 people were killed by sharks. In response, shark nets – or ”shark meshing” – were introduced in NSW in 1937. The meshing is still there, put in place each year from September to April. Costing the State Government $830,000 annually, the nets catch an average of 140 sharks a year – not to mention the turtles, rays and dugongs. Since 1937 there has been only one fatality at a meshed NSW beach, Newcastle’s Merewether in 1951. In Sydney Harbour the last fatality occurred in 1963, while the most recent NSW death was at an unmeshed Ballina beach in 2008. And for every fatal attack, there are two non-fatal attacks. Of those attacked by a shark, about 70 per cent survive. A marine ecologist at Macquarie University, Dr Iain Field, says the slim chances of being attacked by a shark can be further reduced by choosing when and where you swim. Many shark attacks are cases of mistaken identity. ”Being the cleaners of the sea, sharks take the infirm,” Field says. ”And a surfer splashing about on the surface can indicate an animal in distress. Australia has an amazing abundance of shark species, Field says, but we have detailed biological information for only about 10 per cent of them. ”We are still discovering new species and new subspecies,” he says. Numbers are hard to gauge but Field says there is compelling evidence the populations of most species are in decline. In recent years, dramatic innovations in shark repulsion include the Shark Shield, which creates an electromagnetic field around the user. Some universities have made them mandatory for underwater researchers. In the future, such technology could potentially be used to create electromagnetic shields around beaches. At Bondi in February, Orgias never saw the shark that attacked him. He survived, he says, because of his pregnant wife. Orgias and I are having lunch in a CBD courtyard full of pin-striped predators. In between mouthfuls of chicken schnitzel, he shows me his prosthetic left hand. It’s the same type of hand that de Gelder now has. And, like de Gelder, Orgias is surfing again. He gets out into the line-up as often as he can at Bondi or Maroubra.